Did Elvis Meet Jim Morrison in Jerome? Here is an interesting tale, a very well written story of a first encounter/meeting of Elvis and Jim Morrison in Jerome. On the one hand, a beautifully written piece of creative story telling. But on the other hand it does bring up an interesting and probably little known fact. Elvis did actually make a film in the area. 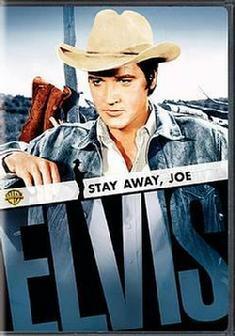 He was known to have filmed in Sedona and the Cottonwood area during the making of Stay Away Joe. So its entirely probable that Elvis did in fact visit Jerome at some point. To add some additional intriguing details to the story of this film, an album was made known as the Stay Away Joe album, which was an LP created by RCA for the sole purpose of a one-time broadcast on one radio station, KVIO in Cottonwood. One only copy is known to exist, which featured 9 gospel tunes, and some promotion for two other albums, His Hand in Mine, and How Great Thou Art. In fact you can listen to a clip introducing the broadcast here! Although the town of Jerome may have been founded in 1876, it had its beginnings centuries earlier, as a small mining area of the local Native American Yavapai tribe. The area was first explored by Europeans in the 1500's on a quest for the Seven Cities of Gold. Local legends that gold had been discovered here eventually attracted pioneers in the 1870s, who began to stake claims. It wasn't the gold however that put Jerome on the map, as much as it was copper, and the United Verde Copper company ultimately mined over a billion dollars worth of copper, gold, and silver in Jerome. Jerome was finally incorporated in 1898, and grew to a bustling town of 15,000, the fouth largest town in the Arizona territory. It became notorious in the west, due to lawlessness and lack of government, and earned the nickname, the 'Wickedest Town in the West', with an abundance of saloons, brothels, and opium dens, the Las Vegas of its day. The boom years of the roaring 20's led to the bust of the Great Depression, and as copper prices collapsed, the mine was closed in 1930. During the mid 30s, the minings claims were bought by another company, and blasting ore began on such a large scale that a block of downtown Jerome actually slid several hundred feet down the hill. Despite a brief resurgence during World War II, as copper prices improved, the new mine closed in 1952, and Jerome was destined to become a ghost town, with no more than 50 remaining residents. It wasn't until the 60's, that adventurers and wanderers discovered the deserted ghost town, began carving out a new life in the abandoned buildings and homes, and Jerome began its path to a renaissance. Currently Jerome is a town with a population of 444 residents, and numerous local shops, restaurants and hotels to serve, by some estimates, up to 1.5 million tourist visitors per year. With the attraction of the Wild West past, the remaining ghostly presence of yet to be rescued old structures, and legends of ghosts and spirits abounding, no visit to the Sedona area should go without an encounter with the haunting beauty of Jerome.